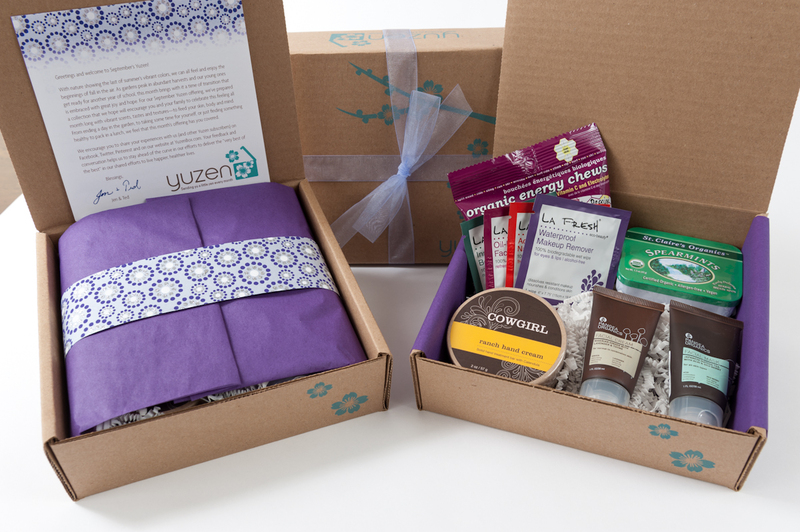 A Yuzen subscription delivers an assortment of natural and organic health and beauty items to your home each month. Image source: yuzenbox.com. Is there anything nicer than getting a package full of surprises in the mail? How about a package full of surprises in the mail once a month! I’ve noticed a growing number of monthly subscription-box services popping up lately; I decided to check out a bunch of them and report my findings here. Previously reviewed: Knoshbox, La Bella Box, Umba Box, Nicely Noted, For the Makers, and LootCrate. And for kids, there’s Wonder Box, BabbaBox, Kiwi Crate, Little Passports, and Green Kid Crafts. Sample Sprig Box contents. Image source: Melissa Wiley. 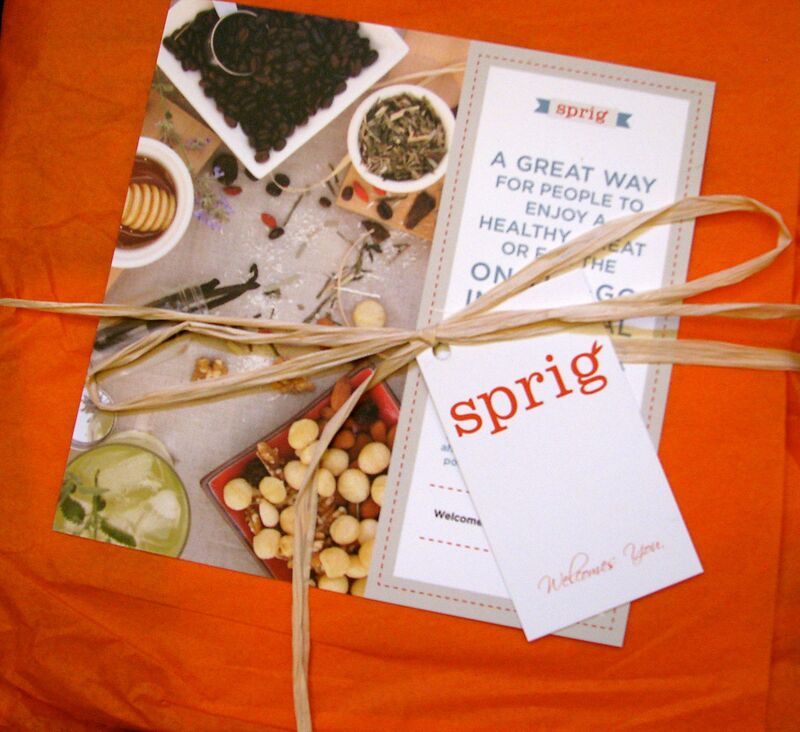 Sprig is a sampler of healthy snack foods — gluten-free, mostly organic and vegan nutritional snacks. My fourteen-year-old daughter liked the assortment so much that she wants a subscription of her own. What I enjoyed about the Sprig box is that it allowed us to sample new-to-us items without having to buy a whole package of each. It was a fun way to expose my kids to some new (and nutritious!) foods. Sample contents: Bearded Brothers Bodacious Blueberry Vanilla Energy Bar; Lucy’s Cinnamon Thin; Just Good Chocolate Tart Cherry Almond Cacao (soooo good); Picky Bars Smooth Caffeinator Hazelnut Mocha Madness; Ananda’s ShanTea Middle Way Goji/Ginger; Hail Merry Orange Rosemary Pecans; Bumble Bar Organic Sesame Bar (two bars: one peanut, one chocolate crisp); Kookie Karma Holistic Chocolate Chip; Apple-2-The-Core Peeled Snacks Fruit Picks. Monthly subscription cost: the Mini-Snacker box (10-13 servings) is $26.95/month; the Snacker (25-30 servings) is $55.95; and the Grand Snacker (53-60 servings, so perhaps best suited to an office setting) is $99.95. Gift subscriptions available? Yes; pricing info here. 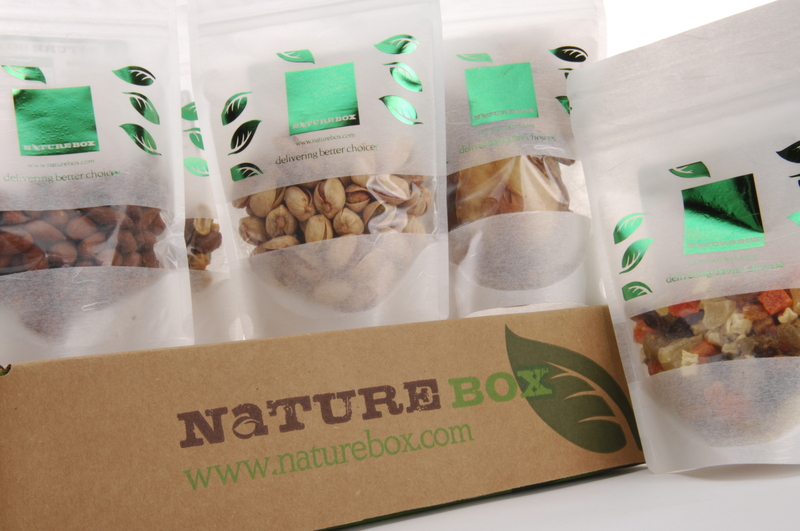 NatureBox is another healthy snack-food subscription. Each month, you get a box containing 4-6 packages of “wholesome, minimally processed” snacks, 15-20 servings total. The idea here is that instead of buying junky snack foods full of salt and artificial ingredients, you’re letting NatureBox curate a selection of tasty treats that are actually good for you. And for each box purchased, the company donates one meal to feed the hungry through Feeding America. Like Sprig, a NatureBox subscription would make a fun and unique gift, a lively alternative to the traditional fruit basket or holiday popcorn tin. Sample contents: The October box contained 5 packages — cherry berry granola; sun-dried California apricots; blueberry almond bites (crunchy squares made of almonds, dried blueberries, and puffed rice, quite delicious); a “Sticks ‘n Stones” snack mix (almonds, sesame sticks, and cashews); and an “Antioxidant Mix” (chocolate stars, mixed nuts, and dried cherries, cranberries, and blueberries). You can probably match the price of similar foods in the bulk area of your local health-food store, but there’s an element of adventure to getting a surprise assortment by mail. It also strikes me as a great gift for a college student — a care package of healthy munchies to provide an alternative to vending-machine snacks. Monthly subscription cost: $19.95 (includes shipping). Signing up activates the monthly subscription; you may cancel or pause at any time. Gift subscriptions available? Yes, in 3-month, 6-month, and 12-month options. Yuzen springs out of the trend of sample boxes — subscription boxes containing assortments of sample-sized health and beauty products — but with an emphasis on eco-friendly, natural or organic items. Another difference is that Yuzen’s collections contain full-sized or “premium sample-sized” products when possible. Just as Umba Box seeks to provide subscribers with carefully curated handmade items from Etsy shops, Yuzen offers a curated selection of creams, cleansers, snacks, and other body-and-soul-pampering items. I can think of several people on my shopping list who would take delight in a box like this. Sample contents: The October Yuzen box contained a delicious Matt’s Munchies mango fruit-leather snack, a small jar of Nova Monda Cacao Indio chocolate ganache (to die for), some Hollybeth Organics rose geranium face moisturizer, some Red Flower samples (Mimosa Sea Algea Wash & Plum Blossom Silk Cream), Eco-Aurmour Bergamot and Grapefruit Shaving Foam, and Jamu massage oil. The September box emphasized organic skin-care products: Cowgirl Ranch Hand Cream, a tulle bag full of product samples (makeup remover, nail polish remover, face cleanser), a bottle of Pangea Organics facial cream, a matcha tea facial mask, plus some organic spearmints and pomegranate energy chews. Gift subscriptions available? Yes: one month, three months, or six months. If health and beauty product samples are of interest, two more subscriptions to take a look at are Conscious Box and BlissMo. Both offer assortments of natural/organic skin and bath products, vitamins, healthy snacks, and teas. Sample boxes provided for review.